A two minute walk takes you to the shores of the Beauly firth – the possibility of viewing dolphins, otters, bird life (including the red kite and curlew) plus many other aspects of nature, will amaze you. 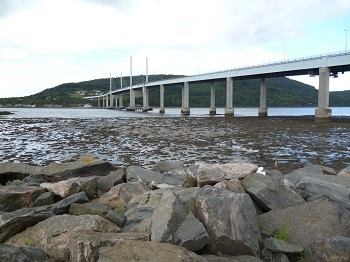 The wide expanse of the firth and beyond to the surrounding hills, including a fine view of the Kessock Bridge, will make your choice the right one. The site is very peaceful but if you would like to enjoy the hustle and bustle of city life then a ten minute drive takes you to the very capital of the Highlands - Inverness. The decking with anti-slip access and gate (for a little privacy) has table and chairs for relaxing outdoor meals. There is also a cosy table at the rear of the caravan overlooking a large sloping field, affording even more opportunity to relax, perhaps with a sundowner - in peace and tranquility. The appearance of sheep and the occasional deer and fox adds to the atmosphere. There are ample areas for walking, jogging, cycling and fishing. The site has a games room, small play area and laundrette. The nearest hotel (The Kessock) and the White Cottage tearoom are 2.5 miles away and are popular with locals and holidaymakers alike.